I put this particular peony near the north fence line and after burying the tuber, I covered the area with mulch and marked it with a stick and then a stone ring. 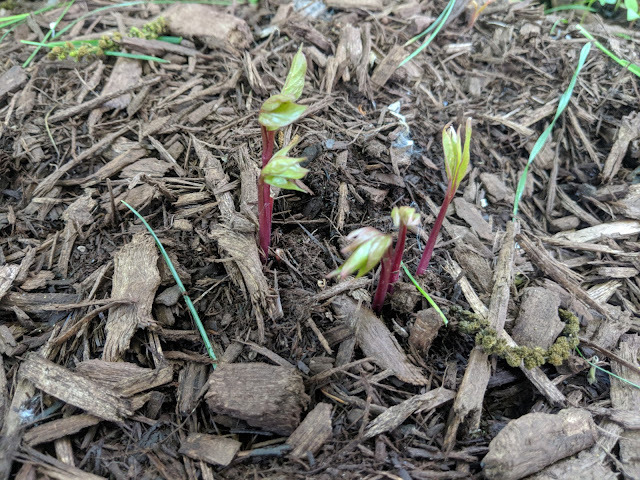 We were putting together Fairy Gardens with the kids recently and I noticed that the peony shoots and broken through the mulch and we had some actual growth. These are way, way behind what most normal, established peony plants look like by June. This is normally the time we're cutting the blooms and bringing them indoors. Since this was planted as a tuber this year, I was just hoping that we'd get these to emerge this year and that they'll have enough time to establish their root system before the dry/hot season comes on this Summer. I think they're on their way, so I'm hoping that by next year, we'll be getting our first blooms from this plant. I'm planning on going to get our foster peony this fall (September) and will add it to this area to start a little peony section in Hornbeam Hill.